The bus slowly pulled out of the Coop’s parking lot. Every tour driver knew about Carding’s tight turns, its determined lack of large parking lots, and the town’s collective decision to keep it that way. So there really was no choice but to move and turn slowly. Its large tires did their best to embed more sand into the asphalt oasis surrounding the legendary general store, making a sharp, crackling sound as the driver guided the bus onto Meetinghouse Road. Andy Cooper stood among the shopping baskets and carts in the Coop’s large front windows, watching the last wisps of diesel disperse in the morning air. He sighed with satisfaction as he saw it go. He looked forward to November every year—the month of gray and gloom—because it was his respite between the hordes of leaf peepers and the hordes of skiers that would descend on Mount Merino when it snowed in December. He studied the landscape of the hills rising from the center of town. The maples were naked now, except for a few straggling yellow leaves that would disappear with the next good wind. All that remained were their skeletons. Early November was the time of the oaks and beech. They were bunched together here and there, their leaves making clouds of deep red tinged with smudges of yellow. In a few days, any leaves that remained would be leathery brown. Andy felt something press his shoe, and he looked down at the dog pawing his sneaker. He stroked her soft ears, the part of her responsible for her name, Sable. He’d been dog-less for many years—and determined to stay that way—when this girl trundled out of a humane society van parked at the Coop for Pet Adoption Day. Something about the way she looked at him—and her sadness at not-belonging—had re-awakened Andy’s desire to share his life with a dog. “How about a walk, girl?” he asked. She was at the store’s door before the last word passed Andy’s lips, silently encouraging him to move faster. He sighed. Had she been a mistake? Was he too old for this? Outside, he clipped on her leash while they threaded their way through the parking lot. He had to admit she was pretty good about not pulling but he could see it was a strain for her to resist the impulse to run. When they reached the top of the path that cut through the woods to Half Moon Lake, Sable quivered as he let her off the restraint, bolting to explore the leaves for signs of chipmunk and squirrel. The path was ankle-deep in crisp brown leaves, and Andy deliberately scuffed through them, enjoying the rustle that accompanied his steps, and breathing in the almost-spicy aroma of death and renewal that marked this time of year. He stopped to zip his jacket around his neck then picked up his pace. The slant of the light came through the bare trees at a low angle, all golden and sated with autumnal hues. How long has it been since I’ve walked down here, Andy wondered as he stopped to admire the stained-glass effect of sun behind the oaks. Sable circled him, snuffling, running, and nosing among the rocks of an old stone wall. 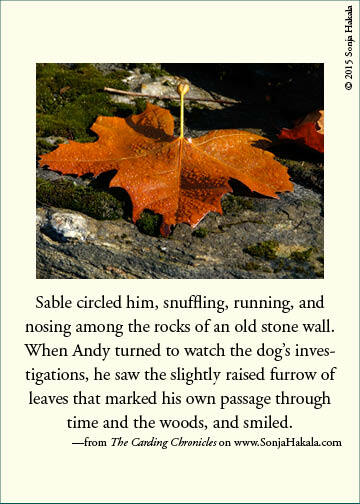 When Andy turned to watch the dog’s investigations, he saw the slightly raised furrow of leaves that marked his own passage through time and the woods, and he smiled. At that moment, Sable looked up, and Andy realized she was no longer afraid, no longer lost, and he was content.